Murdoch followed up his 1992 coup with a switch from Tories to Labour six weeks before Tony Blair’s landslide 1997 victory. Can anyone believe “it was the Sun wot won it”? Please. It was Blair wot won it – and the Murdoch press made a shrewd decision to throw in its lot with him. 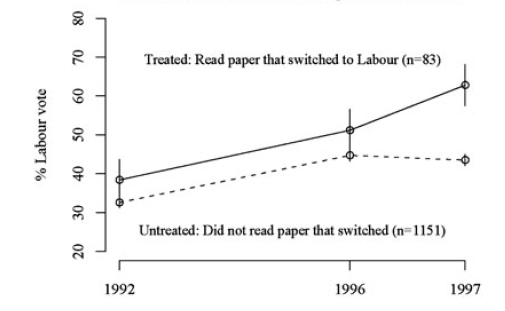 …we exploit a rare change in communication flows—the endorsement switch to the Labour Party by several prominent British newspapers before the 1997 United Kingdom general election—to study the persuasive power of the news media…By comparing readers of newspapers that switched endorsements to similar individuals who did not read these newspapers, we estimate that these papers persuaded a considerable share of their readers to vote for Labour. 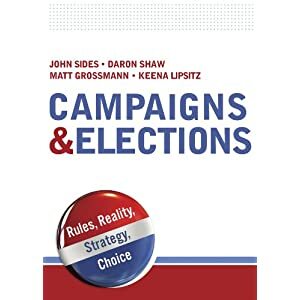 Depending on the statistical approach, the point estimates vary from about 10% to as high as 25% of readers. There is a lot of additional labor (labour) in the analysis to rule out confounding factors, as best as possible. Surely Murdoch has responded to public tastes in numerous ways over his long and successful career. But in terms of the political endorsements of British newspapers like the Sun, there is evidence that Murdoch has also led public opinion. Floating All Boats, or Just Mine? Somebody should tell these dudes about coefplot. Those tables are horrible! Hi Andrew. You’re right! If we were presenting these results now, we would probably add a figure illustrating the coefficient sizes in coefplot format.